We already made our bold group play predictions. You read about those here. 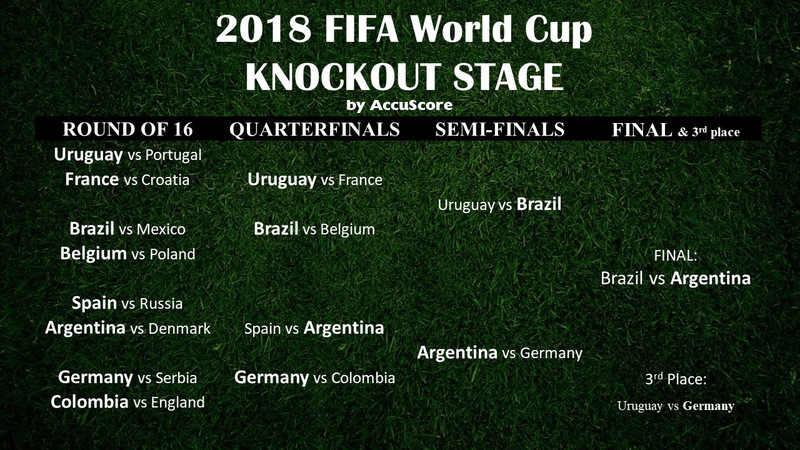 Now, based on Accuscore’s World Cup 2018 Group Stage Predictions, here is what our simulators see happening in the knockout stages. Keep in mind, the above outcomes are only the most likely results. There are countless different outcomes — if the pairings change after the groups. That said, the one particular team doing better than anticipated is Uruguay. We see Uruguay upsetting reigning European Champions Portugal in the first round, then ousting the new generation French dream team. Brazil eventually proves to be too much, but Uruguay – led by goal scorers Luis Suarez and Edinson Cavani – might just be the dark horse of the World Cup 2018. Get your bets in now at bet365!